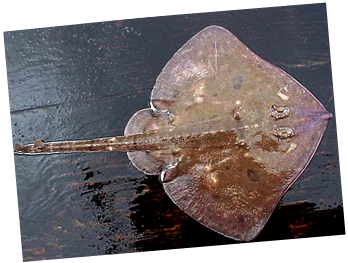 The Alaska skate is potentially the most common skate in Alaska. It can be found mainly in the Bering Sea but also off the coast of the Gulf of Alaska and the eastern Aleutian Islands in depths of 17 to 392 meters. It trolls the ocean floor for food and hides from predators in the sand. 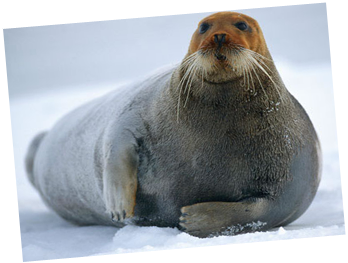 Bearded seals live in Alaska’s Beaufort, Bering, and Chukchi Seas in waters less than 650 feet deep. This species uses sea ice to rest, give birth, and molt, and is rarely found on land. They are relatively solitary animals and can live more than 25 years. In Alaska, the majority of snow crabs are found in the Eastern Bering Sea but they have a range extending up into the Chuckchi and Beaufort Seas. 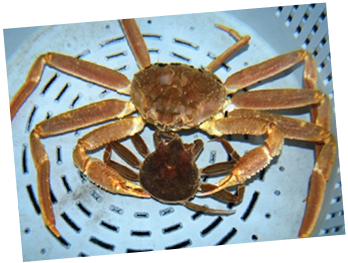 The size of snow crabs varies with water temperature (i.e., smaller in the colder northern waters and larger in the southern Bering Sea which is where males are commercially harvested). 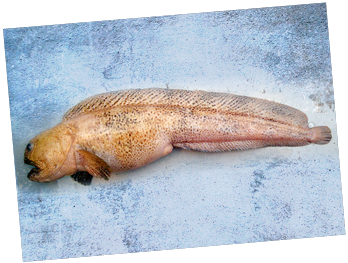 The Bering wolffish lives in the Bering and Chukchi Seas and the Northern Gulf of Alaska, including Prince William Sound. They live in cold coastal waters in gravel or sandy bottom substrate and are usually not found deeper than 100 meters. Wolffishes are long-lived and slow-growing and usually live as solitary individuals or in small groups. 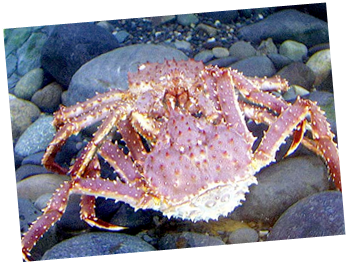 The red king crab can be found mainly off the coasts of the Bering Sea and Aleutian islands, but also throughout the waters of southeast Alaska in depths of up to 250 m. These crabs are known for their large size and flavor, making them a popular commercially harvested crab in the winter months. 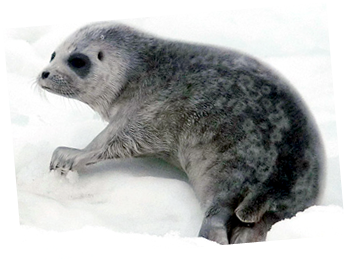 Ringed seals live in the Beaufort, Bering, and Chukchi Seas. They inhabit the sea ice, and create breathing holes and birthing lairs with their front claws. They use ice to rest, molt, and give birth. They can live up to 43 years. 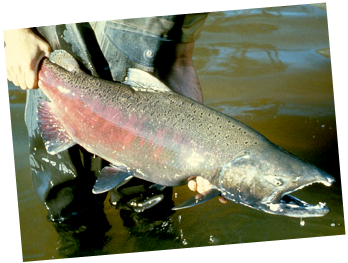 The Chinook salmon (also known as king salmon) live in the seas along the majority of Alaska’s coast and spawn inland throughout freshwater rivers, streams, estuaries, and wetlands. Spotted seals are found in the Beaufort, Chukchi, and Northern Bering Seas in the summer months and in the southern Bering Sea and Aleutian islands in the winter. They rely on sea ice to breed, give birth, and rest. 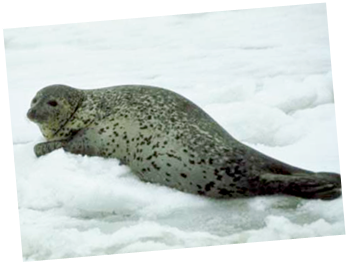 Spotted seals are indistinguishable from harbor seals where the ranges of the two species overlap in the southern Bering Sea. In Alaskan waters, the Pacific sleeper shark is found in the Bering Sea, the Aleutian Islands, and the Gulf of Alaska. 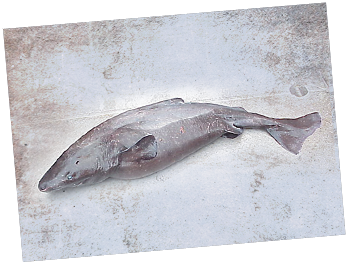 This species is closely related to the Greenland shark, which may cause difficulty when distinguishing between species in the Arctic where their ranges may overlap. It is usually found close to the water’s surface, but can dive to depths as deep as 2,000 meters. They are also not considered economically valuable to commercial fisheries. The Pacific walrus can be found off the coasts of the Bering and Chuckchi Seas hauled out on sea ice, the shore, or diving for food nearby. 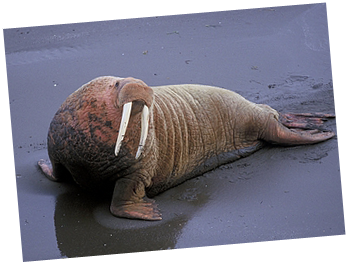 The walrus is the largest pinniped species in Alaska. It can rotate its hind flippers or uses its tusks to help drag its body across land and ice. They are often found in large groups and have strong social bonds with one another. 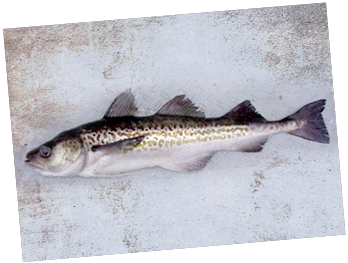 Walleye pollock in Alaska are found predominantly in the Bering Sea and Aleutian Islands, with a smaller stock in the Gulf of Alaska. They can be found near the surface of the water, in shallow water when spawning or feeding, or in depths greater than 500 m. They migrate seasonally to inshore waters to either spawn or feed and move to deeper waters in the winter. They also school together in large groups. BioMap Alaska requests the assistance from citizens of Alaska in tracking the movement of species of interest across the state. 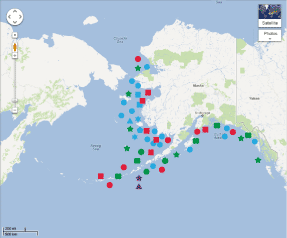 Citizens use this website to Report Sightings and the reports are directly verified by the BioMap Alaska team and their network of Scientists. Confirmed sightings are added to the BioMap which can be viewed on this website. Copyright BioMap Alaska 2012. All rights reserved.